Ramtin Attar, Robert Aish, Jos Stam, Duncan Brinsmead, Alex Tessier, Michael Glueck, Azam Khan. Physics-based Generative Design. CAAD Futures Foundation. 2009. 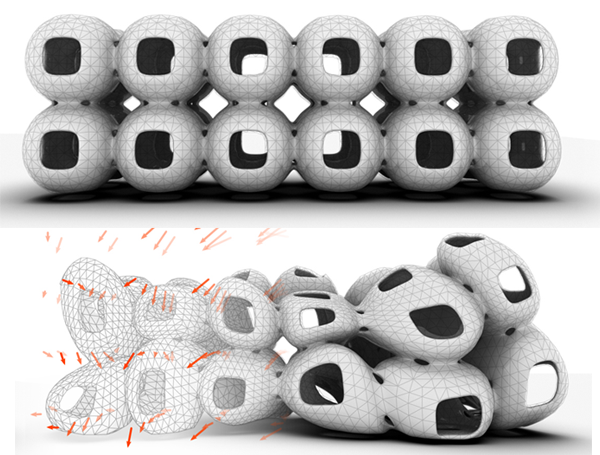 We present a physics-based generative design approach to interactive form-finding. While form as a product of dynamic simulation has been explored previously, individual projects have been developed as singleton solutions. By identifying categories of computational characteristics, we present a novel unified model that generalizes existing simulations through a constraint-based approach. The potential of interactive form finding simulation is explored through exemplary studies: a conceptual approach to a fixed form that acts as a visualization of interacting forces, and a constraint-based model of the fabrication logic for a panelization system are examined. Implications of constraint-based simulation on future directions are discussed.